By this point, I like to think that we’re friends. I mean, this beautiful friendship bracelet that I’m making for you certainly indicates that. And, because we’re friends, you know me. You know that I like hot chocolate and bread pudding and deep-frying ridiculous things. You know that I shun cake mixes whenever possible, but I’m not mad at most brownie mixes. You might even know that I am macaron-indifferent but used to pretend to like them because I wanted to seem cool. I hope you also know that the only thing I like better than a big layer cake is a really REALLY big layer cake. Well, my sweet valentines, have I got a really REALLY big layer cake for you. Eight layers. EIGHT LAYERS! That sight makes my little heart go pitter-patter in a way that no paper valentine ever could. This Sky-High Pink and Red Velvet Cake was born out of a dream. A dream to construct the biggest, the sky-highest, the pinkest and the red velvetiest cake the world has ever seen. I dreamed a dream, and then I ate that dream, and it was awesome. The cake itself is the same recipe I use for all of my red velvet cakes and cupcakes. It’s based on a Paula Deen recipe, only I reduce the oil by about 30%, and increase the buttermilk. (When she’s not busy jamming unnecessary fat into things, that Paula knows her red velvet business.) I love that it uses oil instead of butter, because it stays incredibly soft and moist for days, even when it’s refrigerated. When one is making an 8-layer cake, one needs to be prepared for the possibility of having leftovers for a few days. The cream cheese frosting is another old favorite of mine. It uses a little bit of marshmallow cream, and a slightly higher proportion of powdered sugar than usual, so it’s a touch sweeter than some other versions, with a wonderfully light and creamy texture. And finally, I exercised my laziness creativity and decorated the cake with heart-shaped candies. These are Gimbal’s Cherry Lovers Candy, and they’re basically heart-shaped jelly beans in a variety of cherry flavors. They’re gorgeous, right? I chose them for their looks, but their flavor actually works well with the cream cheese and red velvet. Bonus! You can, of course, use any other sprinkles or candies you like. We enjoyed this cake with a friend to celebrate her birthday, so don’t think of it as a one-trick Valentine’s pony. It can also be a birthday pony! An anniversary pony! A good-job-on-your-promotion pony! A you-learned-to-ride-a-pony pony! I’m losing the analogy, but you get the idea. It’s a wonderful cake and a striking showpiece for any celebration. 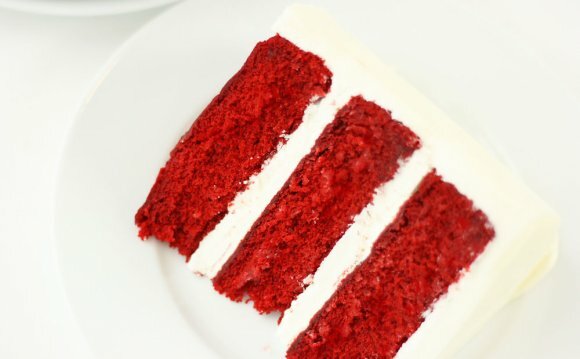 If red velvet cake is good, then a giant, 8-layer red and pink velvet cake must be even better! This beautiful cake is perfect for birthdays and Valentine's Day parties. It can also be made in 9-inch pans if you prefer your cake to be slightly shorter and wider. Preheat oven to 350 F. Line four 8-inch cake pans with parchment rounds, and spray the pans with nonstick cooking spray. Begin by making the red velvet cake: in a medium bowl, sift together the flour, sugar, baking soda, cocoa, and salt. In a separate mixing bowl, combine the oil, buttermilk, eggs, food coloring, vinegar, and vanilla, and mix on medium speed with a paddle attachment until everything is smooth. Stop the mixer, add the dry ingredients, and mix on low until the flour streaks disappear. Turn the speed to medium and continue to mix until any lumps are gone and the batter is smooth. Divide the batter between two cake pans. Wash your bowl and paddle, and repeat the process to make the pink velvet layer cakes. They will be made in exactly the same way, except the pink velvet doesn’t contain any cocoa powder, and the amount of food coloring used is less. Bake the pink and red velvet cakes for 30 minutes, until the tops spring back when touched lightly and a toothpick inserted into the center comes out clean. Cool the cakes completely on a wire rack, then turn them out of the pans and wrap them well in plastic wrap. Place the cakes in the freezer to chill for at least 1 hour before assembling the cake. They don’t need to be frozen solid, but it will be much easier to assemble if they are partially frozen and firm. If you do want to make them in advance and freeze them for several days or several weeks, that’s fine—they will keep well. Just let them sit at room temperature for 10-15 minutes before trying to slice them so they’re easier to cut. Combine the butter, cream cheese, and marshmallow cream in the bowl of a large stand mixer fitted with a paddle attachment. Cream them together until they’re light and fluffy, without any chunks of butter or cream cheese. Add the vanilla and salt, and mix it in. Add the powdered sugar and cream, and mix on low speed until the sugar is moistened. Turn the speed to medium-high and whip until the frosting is fluffy and light. Add more cream or sugar as desired, to get your optimal texture. Use immediately, or store in the refrigerator until ready to use. If it’s too cold straight from the fridge, beat it briefly until it’s a workable texture.